Myanmar is one of the larger countries of Southeast Asia and also one of the poorest. It borders Thailand, Laos, China, Bangladesh and India and has a very long coastline on the Andaman Sea and the Bay of Bengal. Myanmar is famous as the intriguing historical and traditional country, so it becomes an extremely popular destination to visit. With ancient temples and pagodas, untouched landscapes, and an emerging culture that is slowly opening up to the modern world, there is much to learn and discover about this place. Myanmar or called Burma has opened up its doors to tourists so the traveling field in this country is developing more and more. However, to get the best feeling in this countries, we offer some important Myanmar travel tips for you. If you have a valid passport, you can enter Myanmar by land or by air. Passport holders from 100 countries are now entitled to apply for an e-visa meaning you can secure a visa in advance of your travels. For us, it took only a few days from applying to receiving our visa. It is valid for a stay of up to 28 days and costs $50. They advise for you to start applying for an e-visa at least a month in advance as often it can take anything from 1 day to 1 week for you to receive your visa confirmation. Yangon airport is the main airport in Myanmar. International flights arriving into Yangon include Chiang Mai, Hong Kong, Seoul, Kuala Lumpur, Tokyo and Singapore as well as flights from 3 Chinese airports: Kunming, Guangzhou and Beijing. Bangkok is the only international flight in and out of Mandalay airport. One suggestion for you is to print two photo papers of passport or visa and keep carefully in order to miss in the journey. Although you can visit Myanmar every time in the year, due to its tropical climate. However, the wet season leads from June to September which is in full swing so you should avoid. In this period, Ngapali Beach will be closed due to inaccessible roads. From our experience, the best time to visit Myanmar is from November to February as it is neither too hot to walk around due to the cool breeze that blows in. In the next period, March to May are hot, especially in the plains near Bagan and Mandalay. Safety: From recommendations from tourists, traveling around Myanmar is pretty safe, with little violence or petty crime towards foreigners. One safety concern is that using public vehicles processing, let’s keep the important documents in your bag. Another option for you is spending the extra $5 and pay for a VIP ticket to get the safe in the poor traffic. You will be a lot more comfortable and rested when you get to each place. Language: The main language in Myanmar is Burmese, the local people in some traveling areas can speak English. However, this country just opened its doors to other nations in the last few years, the level of English amongst the locals isn’t the same as when traveling other Southeast Asian countries. However, those that do work in the tourism industry have adapted fast and are usually able to communicate things with ease. What is the unforgettable memory trip in Myanmar? Given that the tourism is only starting to boom in Myanmar, hostels, guesthouses, hotels, resorts and popping up left and right. Generally, the accommodations in Myanmar are simple, so the price is quite cheap. Most hotels and resorts have economy dorm rooms where budget backpackers can find solace. Or if you want to get more experience, you can book the homestay overnight. Yangon is known as the largest city and most important center of commerce in Myanmar. After coming here, your interest will be won by the number of the colonial buildings. In addition, the place completely offers the sleepy charm, peaceful parks, stunning lakes, and a wide range of the religious attractions of Buddhism for tourists. You need to ensure some activities when visiting pagodas and temples such as removing footwear before entering holy places, dressing politely, sitting with your face in front of the Buddha statues, having a proper manner, and so on. Additionally, a large golden looks like it can fall down in the valley, which makes the special for Buddhist pilgrimage site. Mandalay in Myanmar is the last royal capital of the Burmese Kingdom, which hold the major significance in the country’s history. You will enjoy the romantic and age-old era with its royal palace and breathtaking moat at the foot of a high and pagoda-topped hill. Moreover, Mandalay is known as a bustling and economic center for business. This place is located within easy distance of ancient cities, former colonial hill stations, and other striking cultural attractions. If you want to get the perfect trip, you should come to Sagaing Hill – the living center of Buddhist faith in the country today. You will approach Sagaing after crossing the Irrawaddy River. It was the capital of Burma for 2 main periods, from 1315 to 1364 as well as from 1760 to 1764. It is said that Sagaing Hill is the center of Buddhism as it offers for you more than 300 religious buildings, including spires, temples, stupas, and monasteries dotted about Sagaing Hill. Although it is certainly a beautiful place with lush, peaceful, and tree-covered hills, most of the visitors just spend a half of day discovering two or three main sites. During this package, we just guide you to contemplate Kaungmudaw Pagoda and enjoy the sunset from Sagaing Hill. 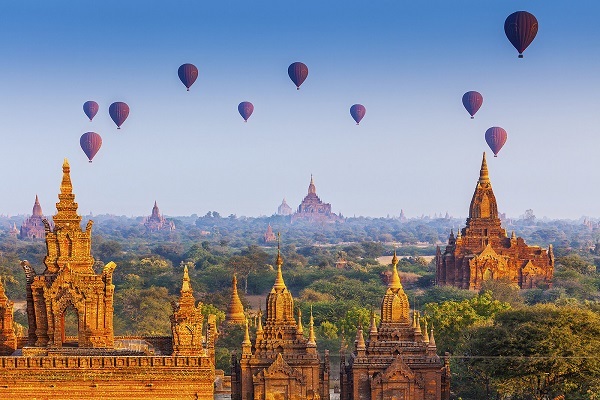 Travellers to Bagan will not have to worry about not having any interesting places to visit. In fact, the only problem they may encounter is deciding on which destination to go to first. As the capital of the first Myanmar Empire, Bagan is home to many archaeological sites. In historical, Bagan has about 13,000 temples however, it keeps 2,220 temples, this native land unleashes fair chances for you to freely explore. There are many temples, pagodas so you will have an opportunity to embark on a spiritual and historical journey as all the buildings are evaluated like beautifully and uniquely designed. Bagan is also home to Myanmar’s archaeological museum, as well as the highly revered Mount Popa. 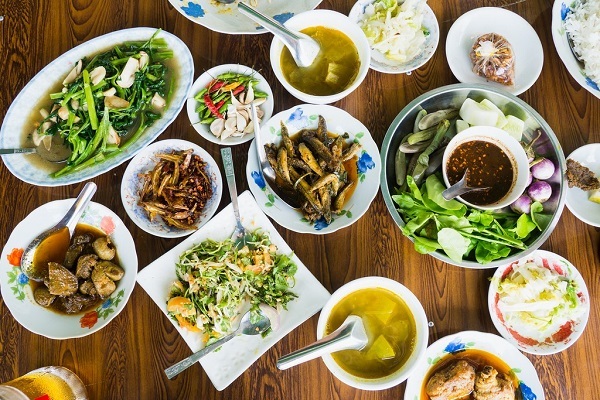 Compared to other countries in Southeast Asia, Burmese food is totally underrated. It has a lot of Thai influence, so it is evaluated variously. There are many foods responsible for your favorite Burmese dishes that you need to try when you’re in Myanmar. One of Myanmar travel tips is choosing the particular foods in there. Tea Leaf Salad is one of the most delicious which many tourists find out. Laphet Thohk is a combination of tea leaves, shredded cabbage, diced tomatoes, crunchy deep-fried beans, nuts, and spice. So let’s try once time, you want to taste again. Mohinga Soup: This dish is a tasty rice noodle soup topped with crispy fried fritters and is considered a staple breakfast meal for many locals. It is served by almost every street food stall. Burmese Curry: Slightly blender compared to Indian curry, the Burmese curry is a lot more similar to Sri Lankan food with a more watery type of broth over creamy. It is very delicious, however, maybe you are difficult to try it. Meeshay: This rice noodle and pork dish is a specialty of the Shan people of the Eastern part of Myanmar. There are various of foods, it is typically rice noodles cooked with pork, lots of soup, and fresh greens. What are the souvenirs you should buy? Paper Umbrella: Paper umbrella can be found in the local workshops around Inle Lake. Wind bell: You are easy to find out in the country, especially around the pagodas and temples. Jewelry: Another item is jewelry you can choose the suitable item as it makes the eye-catching and attractive sight. You can purchase in Yangon, Bagan, Inle Lake, and Mandalay. 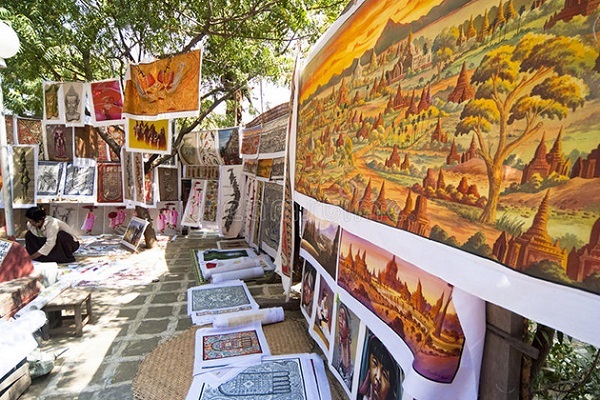 Sand Painting: It is a traditional souvenir which you can see in Bagan. Burmese Cigar: It is worth noting that the Burmese cigar is totally produced with natural materials. Puppet: If you have a favorite like a collection of cute puppets, you can choose the figures of the prince, princess, horses, and so on. Buddha pict. : You completely keep the memory when you have a trip to Myanmar by buying the particular image of Buddha, which are on display in the local souvenir shops. However, one important Myanmar travel tips for you bargain the souvenirs when you buy in the markets and some shops. If you purchase something in the modern shopping malls and commercial centers, you can’t bargain. That’s because every item has its own price’s tag. While you go around the streets and markets for shopping, the merchants tend to sell at the higher prices, particularly in case you are an overseas guest. As a result, before buying anything, you should refer to the cost of some shops and practice bargaining. If possible, try to haggle at about 20-40 % discount of the selling prices.